“ABRABLAST range of garnet abrasives cut faster and last longer, significantly increasing productivity while reducing consumption of abrasive media. 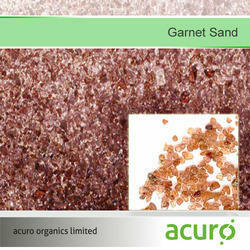 Leveraging on our extensive market knowledge, we are providing a high-quality range of Garnet Sand. Garnet Sand available in 30 , 40, 60, 80 and 100 BSS Mesh , Packing in 50 Kgs & 1000 Kgs. Kothari Plaster is a reputed manufacturer, exporter and supplier; we offer a qualitative range of Garnet Powder. Typical Applications 1. Garnet sand for water jet cutting of materials like steel and stainless steel, non- ferrous metals, granite and marble. We are Exporter of Garnets . We are a unique name in the market to provide our respected customers an exclusive range of Garnet Sand.